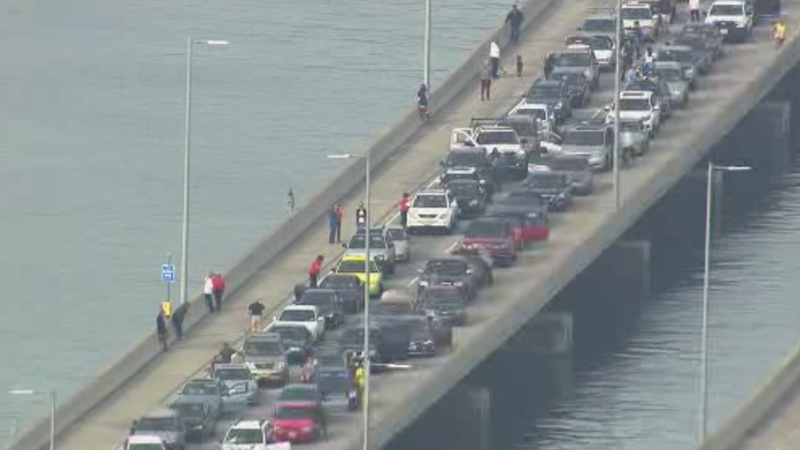 SAN RAFAEL, Calif. (KGO) -- The CHP is looking for the driver who caused a hit-and-run crash that closed down the eastbound lanes of the Richmond-San Rafael Bridge. A tow truck crashed into the side of the bridge Saturday morning. No one was hurt. But all the eastbound lanes were closed until noon and drivers had nowhere to go. So some people got out of their cars and actually found some pretty creative ways to pass the time. Ian Gilligan, 12, who was on his way to a golf tournament used the time to practice his golf skills right there on the freeway.